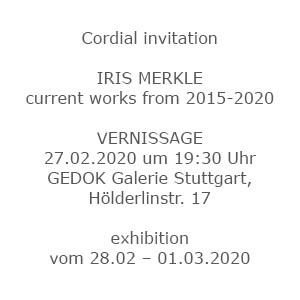 Iris Merkle has lived and worked in Stuttgart, southern Germany, for more than 10 years. She studied jewelry design at Pforzheim‘s renowned School of Design and also at the University of Art and Design in Helsinki, Finland. After completion of her diploma in 2001, she ventured into the area of product design and advertising before returning five years later to her heart‘s desire: making jewelry. In 2014 she received the „Design Art Craft“ award from the German state of Baden-Württemberg, one of Germany‘s top awards for innovative design. In 2015, she presented her works in New York City at the annual exhibition of contemporary jewelry at the MAD Museum of Arts and Design. She has run her own studio since 2007 and holds exhibitions at home and abroad. My current work is focused on the subjects of bereavement, farewell and death. Light and heavy works have arisen from this, which can be felt physically. The casting process of the lost mold initiates a transformation. Real butterfly wings are burnt during the casting process and are now unbreakable. In the process they have nevertheless retained their lightness. Arranged loosely on a string, they create delicate sound combinations and melodies as they touch each other. This jewelry is for wearing and also for hanging, for example, as a wind chime. Then the surface is sure to achieve a beautiful patina. The heavy works rest cold and pressing against the chest. Sometimes a steel wire even cuts into the neck. One would not wish to wear this jewelry for long. It is rather a sculpture, which is not only seen on the body but also experienced.